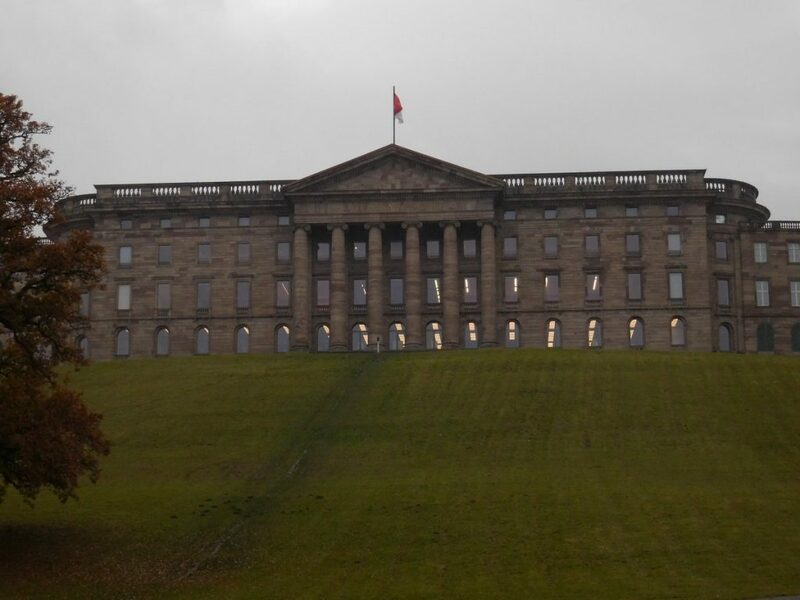 Kassel is one of the lesser known cities in Germany. How I ended up going there twice over a period of four years, I will describe in the next several paragraphs. 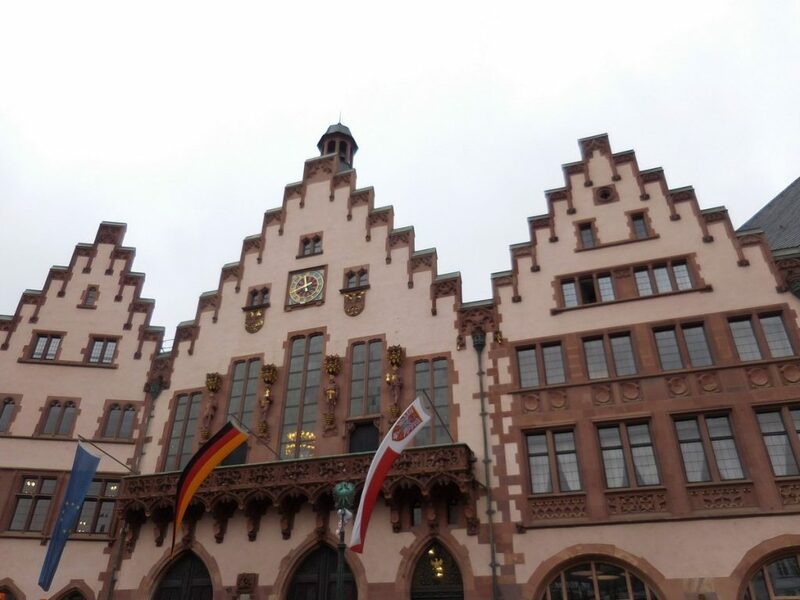 The trip there can be combined with one-day visits of a couple of other places in its vicinity or even going to Frankfurt am Main which is in the same region – Hesse. Nestled in the northern part of the Hesse (Hessen in German) federal state, Kassel embraces the Fulda River which gently washes its shores and seeps into the much more known Main River. The city name derives from the ancient Castellum Cattorum – a Germanic tribe that had lived in the region since Roman times. Kassel’s population is around 200,000 people, spread over a huge territory which gives you a sense of freedom and space. 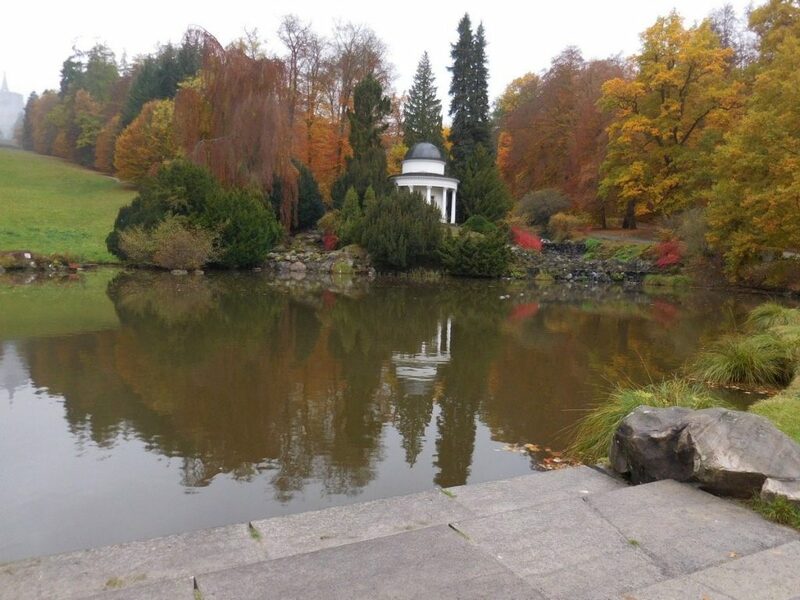 Kassel is dotted with many parks, including Bergpark Wilhelmshöhe (or Wilhelmshöhe Mountainpark; Wilhelmshöhe would literally translate as Wilhelm’s height). The park’s 590 acres (2.4 km2) make it the biggest hillside park in Europe and the second biggest park on a mountain slope in the world. Construction of the mountain park commenced at the end of the 17th century following the Landgraves of Hesse-Kassel’s behest and took around 150 years to complete. 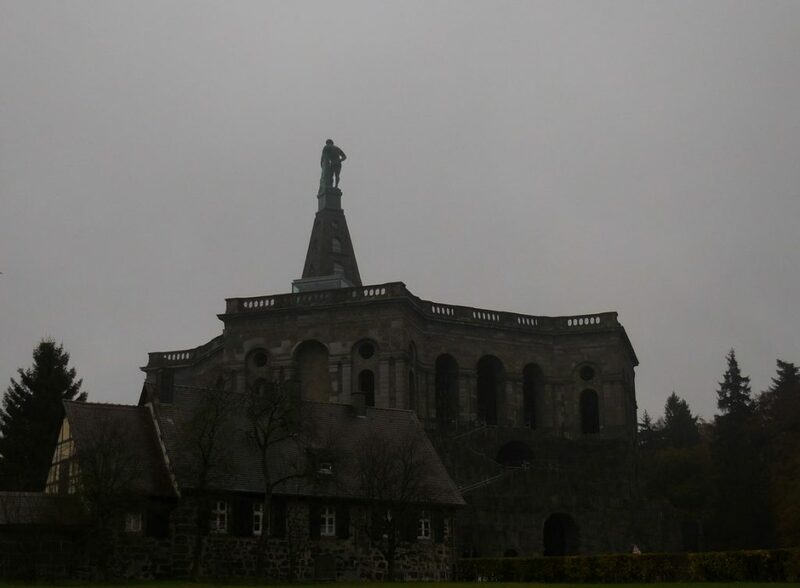 The park is guarded by a copper Hercules monument, placed atop of an octagon and standing at the highest point of Bergpark Wilhelmshöhe. The summit measures 526.2 metres (1,726 ft). In June 2013, during the course of the UNESCO meeting in Phnom Penh, the Mountainpark was announced a world heritage site. The Hercules monument, placed on an octagon, as seen from the Exhibition centre. 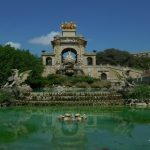 It was originally constructed in a Baroque style, joining elements from the French formal garden (jardin à la française) and Giardino all’italiana (Italian Garden). These styles revolve around and incorporate axial geometry, symmetry, and the principle of enacting order on nature. Les Jardins de Versailles (Versailles’ Gardens) are believed to be an epitome of a French formal garden. 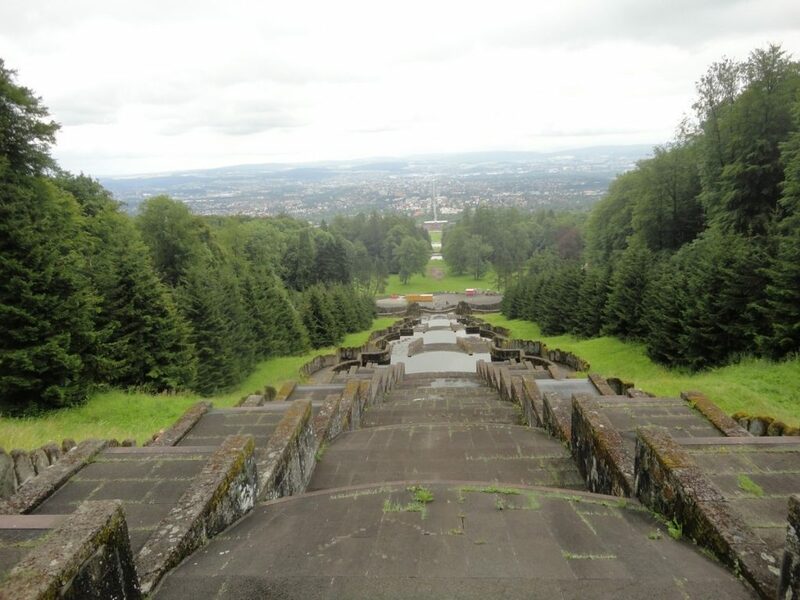 The mountain park is criss-crossed by water features, streaming downhill in drop-dead gorgeous cascades that reach Schloss Wilhelmshöhe (Castle Wilhelmshöhe). Kaiser Wilhelm II used the palace as a personal retreat and a summer residence during his reign. 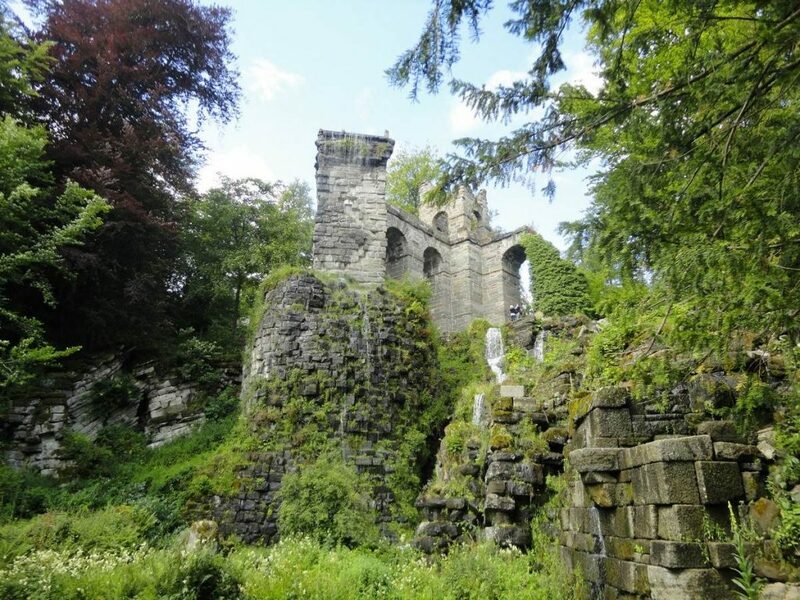 The Bergpark has a Roman aqueduct around which jump waters. The Castle from the front. 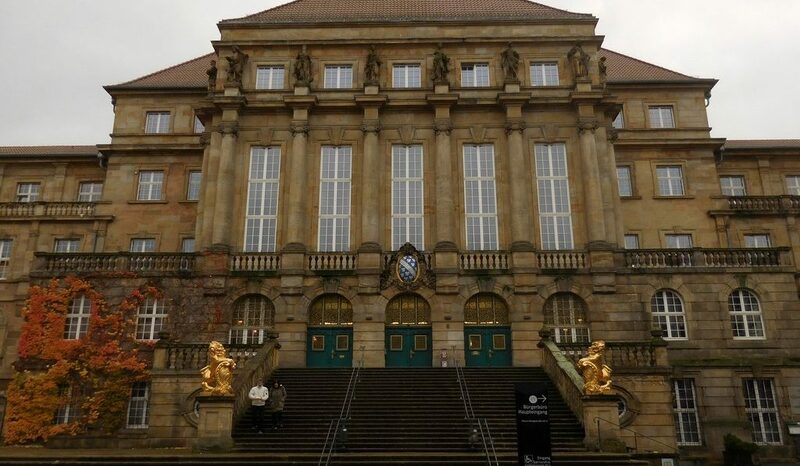 Today, the palace houses the art gallery Gemäldegalerie Alte Meister. To reach the staggering monument of Hercules, you can either walk the whole park up or get there by car or take bus 22 (despite that the city is traversed by trams, only buses go there). If you choose the vehicle rides there, you will arrive at an exhibition centre where you can purchase souvenirs and watch videos of the spellbinding water cascades. Panoramic view on the way to the top. 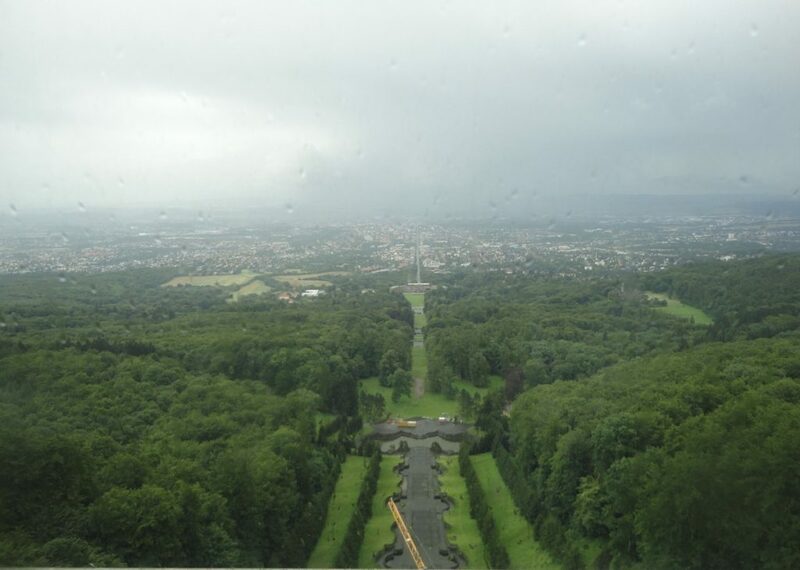 View from the Hercules monument. The city of Kassel breathes fresh air and impeccable cleanliness. The former is due to its rather small size and owing to the fact that the public transportation is mainly trams that quickly ascend and descend the hilly city. The latter is mainly due to the fact that you are in Germany and they keep their cities clean and tidy. The Brothers Grimm (Brüder Grimm), world famous for their fairy tales, have a small statue in Kassel too. It is located at Brüder Grimm platz. 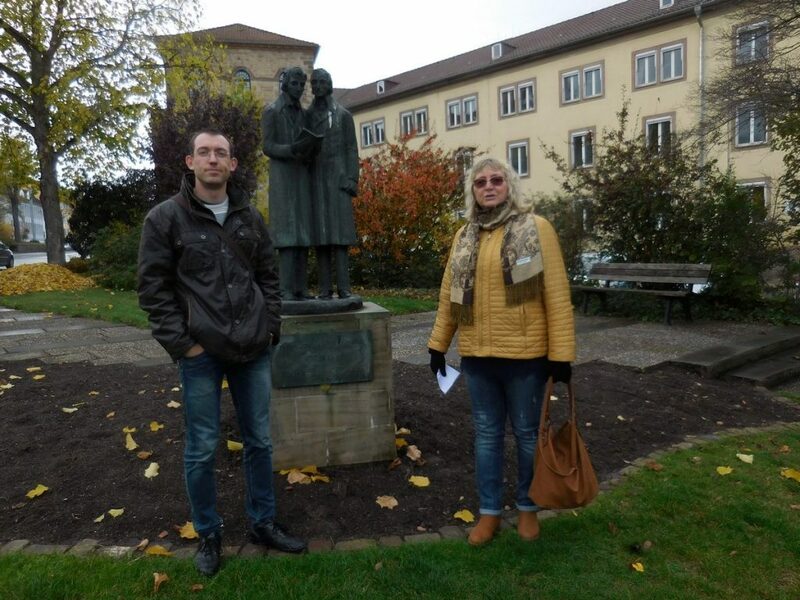 My mother and I with the Brothers Grimm at the background. 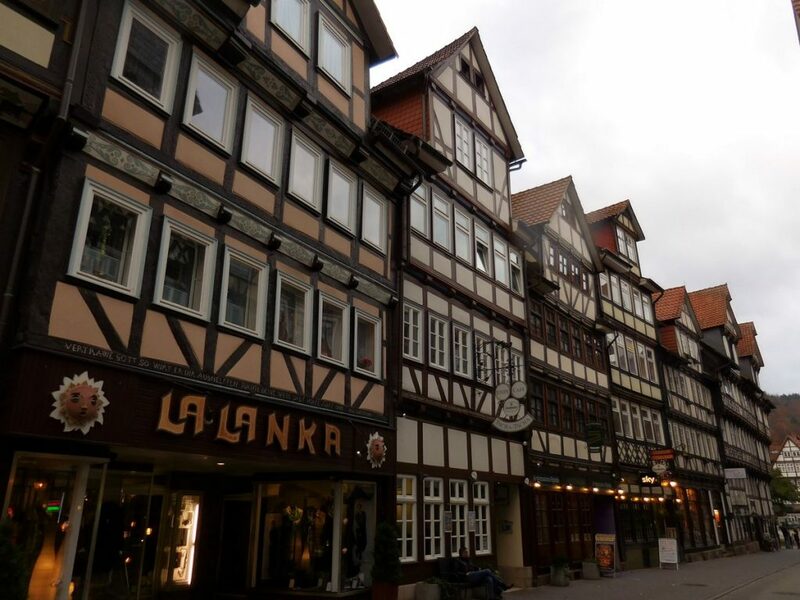 After you have paid your respect to the Brothers Grimm and to Bergpark, you can promenade the spotless streets of Kassel and more specifically the main shopping street – Königsstrasse. It houses an impressive amount of malls and shops for any liking so it’s perfect for killing some time. Since the shopping spree and the crisp air will definitely make you hungry, I will advise you on where to satiate your appetite. 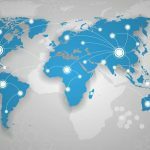 For a city of 200,000 people, having more than 300 restaurants (ranging from traditional German through Spanish and Vietnamese to Chinese, Greek, and Indian) is an impressive number. Located at Karthäuserstraße 5 A, this is a typical Bavarian restaurant, decorated with gigantic wooden beams. But that is not the only thing that is gigantic. Bavarians love to treat their palates and those of their guests. 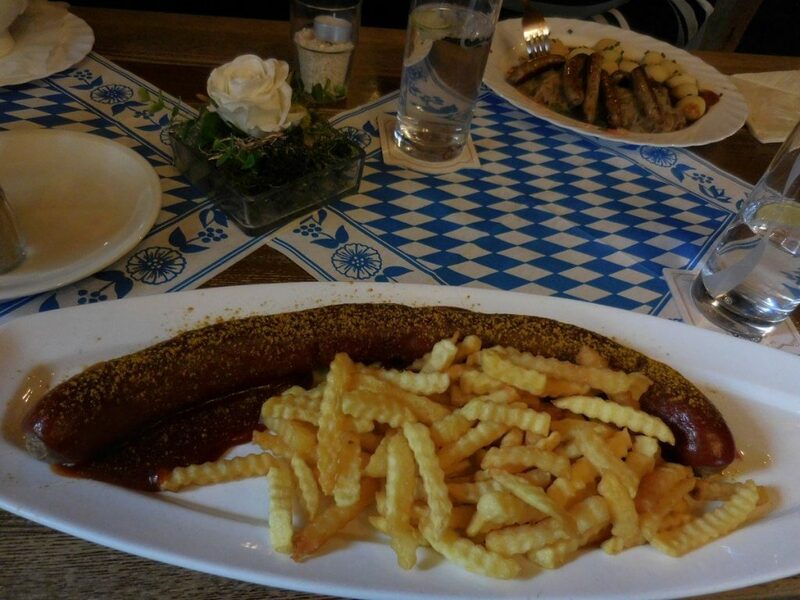 On a recommendation from a friend (thanks, Simon), I ordered a Currywurst. The sausage consists of steamed and then fried pork which is generously seasoned with curry ketchup and sprinkled with curry powder. The dish also comes with an abundant amount of French fries. What was very striking about this meal was that the sausage was gargantuan. Just take a look at the photo I took. Photo – 60 cm of pure meatsomeness (for only 10.90 EUR). 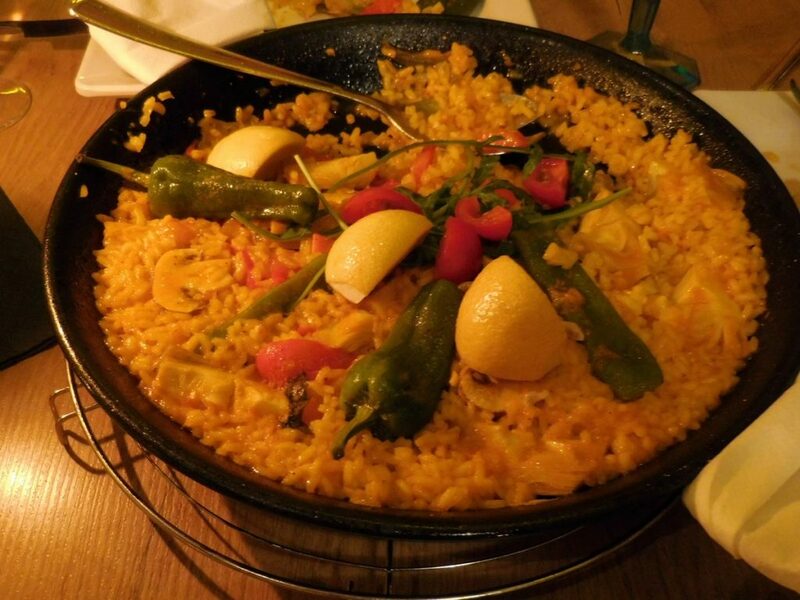 As you have already guessed by the name, this is a Spanish restaurant which is like 2 minutes away from Komödien-Stadl, sitting at Hinter der Komödie 13-15. I tried a seafood soup which was succulent and then a couple of fish plates – all of them delectable. The paella there is gigantic and is enough to feed two people (für zwei personen). 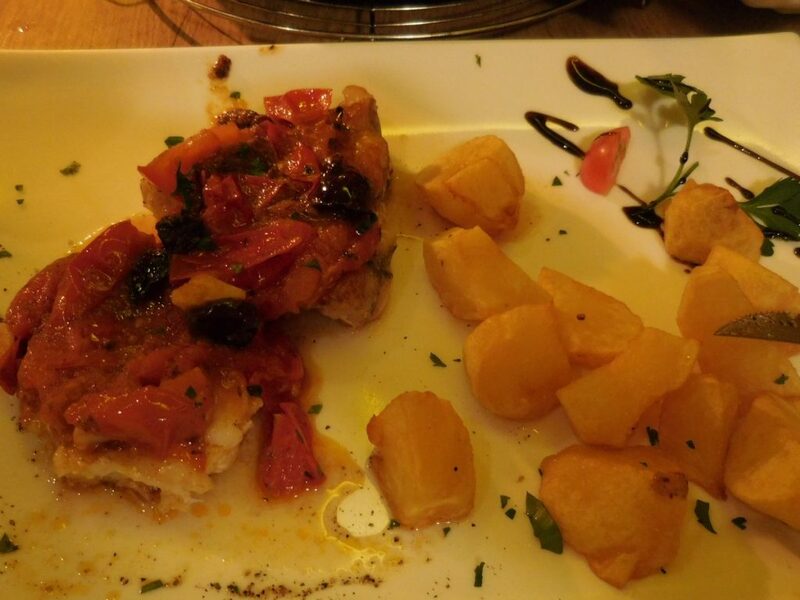 Delicious devilfish with a side of patatas bravas. The paella was appetising and enough to feed two. Orestis is a very cosy Greek restaurant which shines with enormous portions. All the main dishes are also generously accompanied by French fries. In addition, you can make use of the salad bar where you can fill and refill your bowl. Ouzo is served at no cost at the end of the meal as a digestif. PS: If you’d like to go around Kassel, here’s a GPS version to help you go around. *If you download it, I’ll receive a small commission. 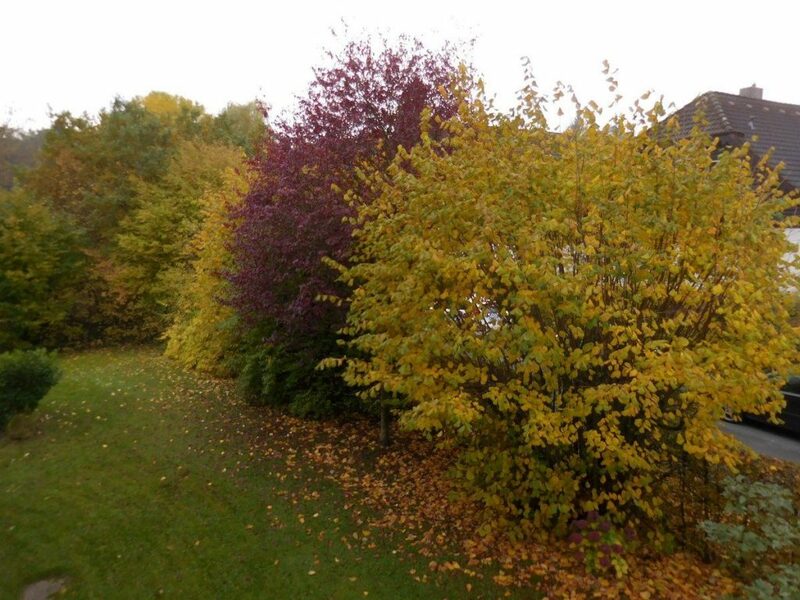 Autumn in Germany is splendid. Yes, I said it, and I can repeat it: Germany surely does know how to produce a masterpiece, having the mesmerising colours of autumn at its disposal. Green flirts with red, and yellow smiles at brown. They have a drink and then mingle to create a picture so ineffable one can only admire with his/her jaws dropped to the ground. Despite the cold and damp weather, this faery of vivaciously dancing colours warms up the heart, enlightens the soul, and leaves all your senses gleefully celebrating. Autumn faery of colours in Kassel. 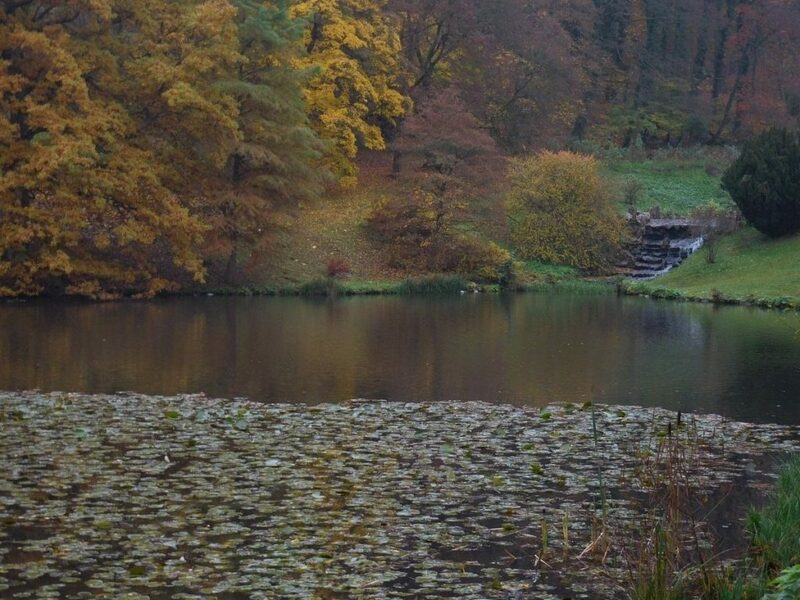 Mesmerising autumn colours in the Mountainpark. I have to point out one drawback, though. There is a severe lack of sunshine and sunlight in Germany, and in Western Europe as a whole, during this time of the year. I guess that’s why the Germans create all the hubbub and tumults around Christmas with their breath-taking markets where the delicate scent of mulled wine toys with the thick body of stollen. Hannoversch Münden (also known as Hann. Münden) is a pretty little town, standing at an equal distance from Kassel and Göttingen. 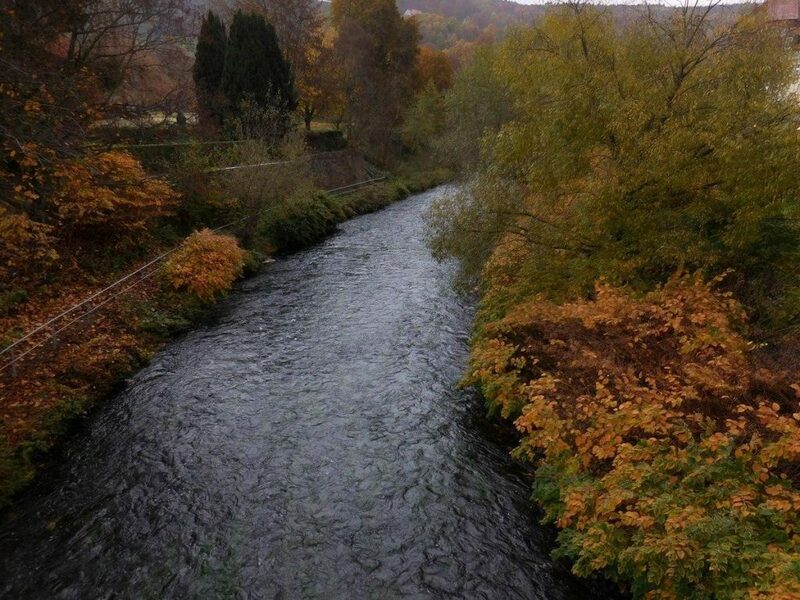 What really makes the town so gorgeous is the fact that it is at the confluence of three rivers – Werra, Weser, and Fulda (which, as I mentioned, empties into the Main River). The Fulda River, passing through Hann Münden. 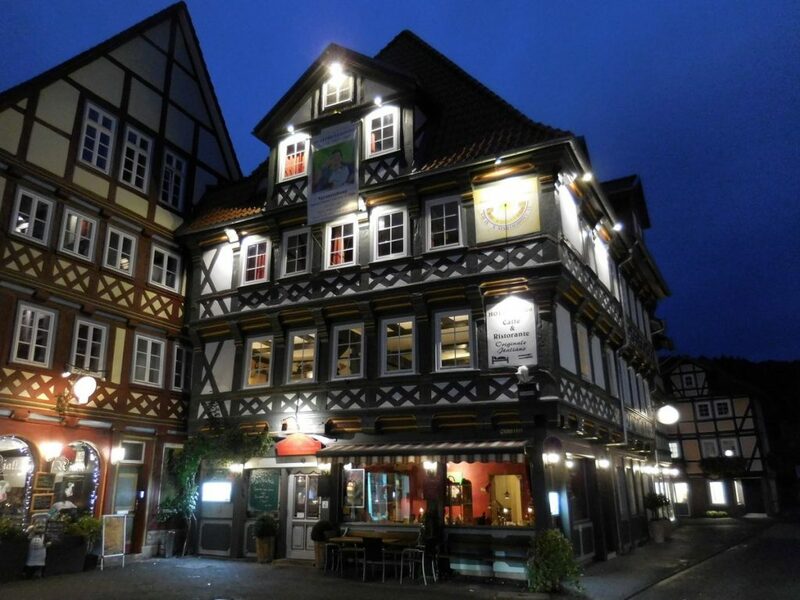 In addition to this, the town’s centre is strewn with traditional restaurants and fabulous buildings which come with marvellous German architecture. What I recommend though is a Chinese buffet place which is a bit away from the centre but so worth visiting. Its name is Lotusblume and is located at Quedlinburger Str. 9, just next to Rewe and Aldi. The architecture seeping from every corner in the small town. For the sum of around 12 EUR, you will eat your heart out with what I can describe as the best Chinese food I have ever had outside of China. What added more pleasant fuel to the delicious fire were the facts that the place is superbly decorated and it was jam-packed even on a Sunday evening. 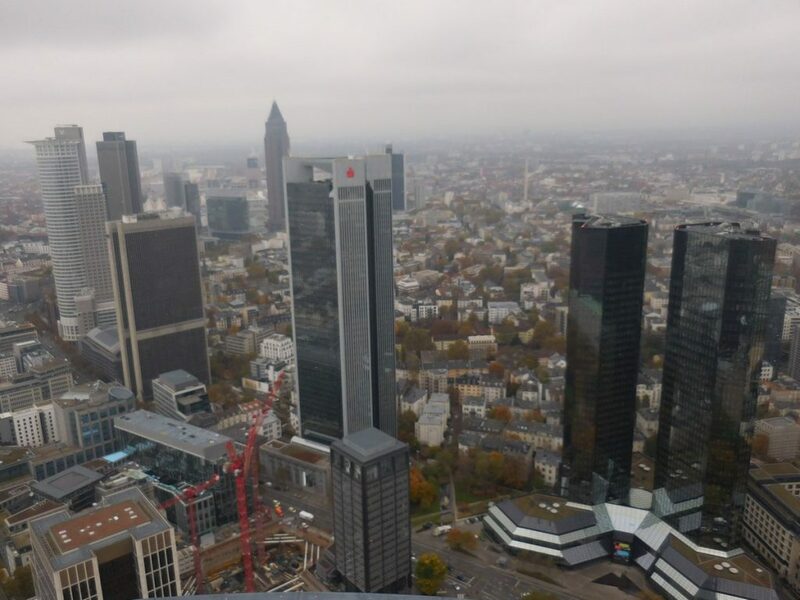 You probably know the city of Frankfurt am Main thanks to the impressive skyline it boasts. Willy Brandt Platz is home to the (New) Opera House of Frankfurt (there is an old one, too, not far away from there) as well as the only institution of the European Union, located in Germany – the European Central Bank (ECB). 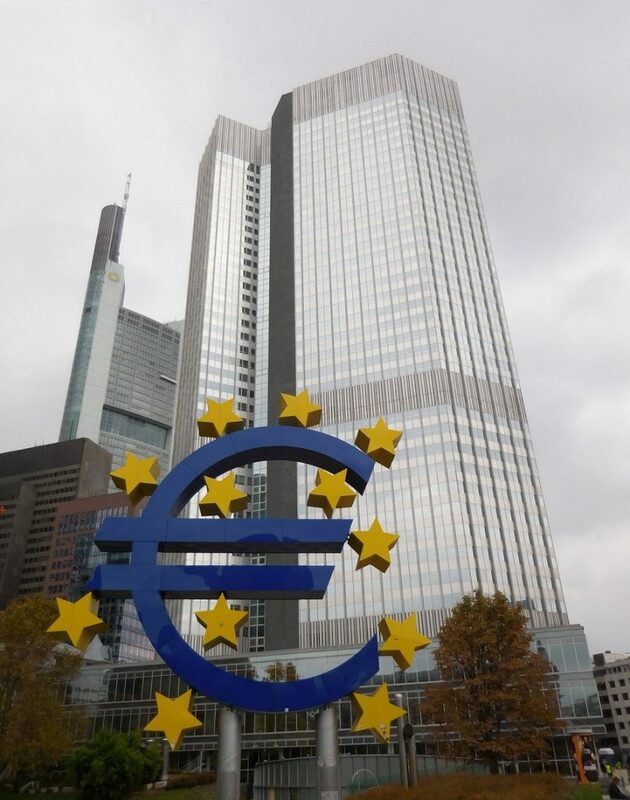 You will easily recognise the building which stands proudly erect next to a gigantic Euro sign. This is actually the former building since the HQ are being transferred to another place in Frankfurt. 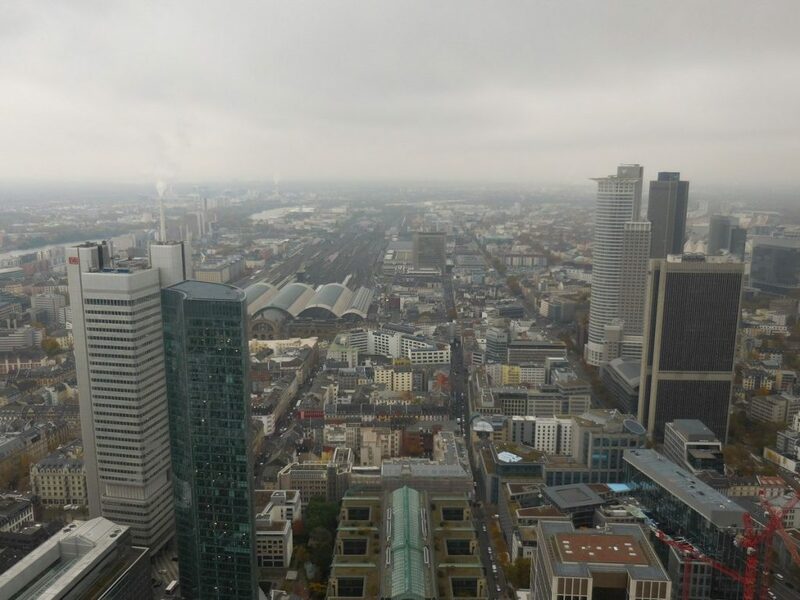 A few blocks away from the European Central Bank are situated the headquarters of Commerz Bank and the Main Tower. 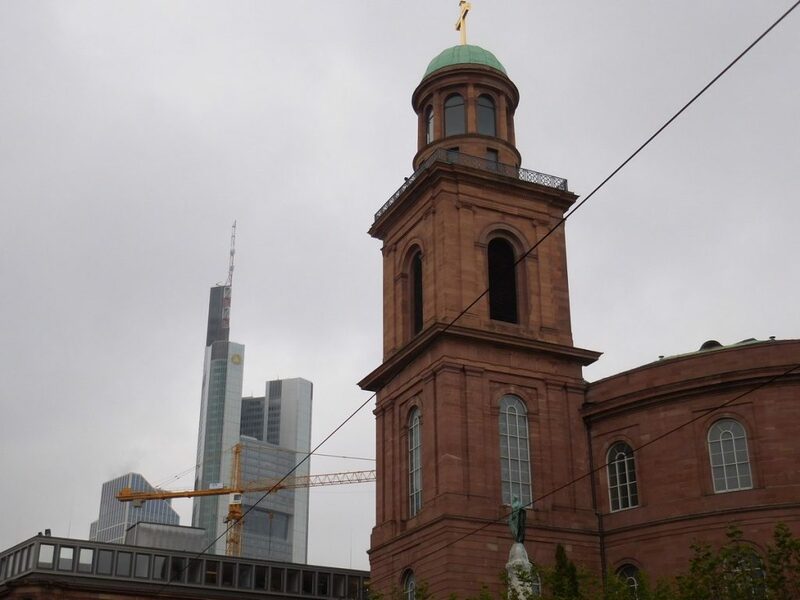 The former is perhaps the most popular part of Frankfurt’s skyline puzzle. 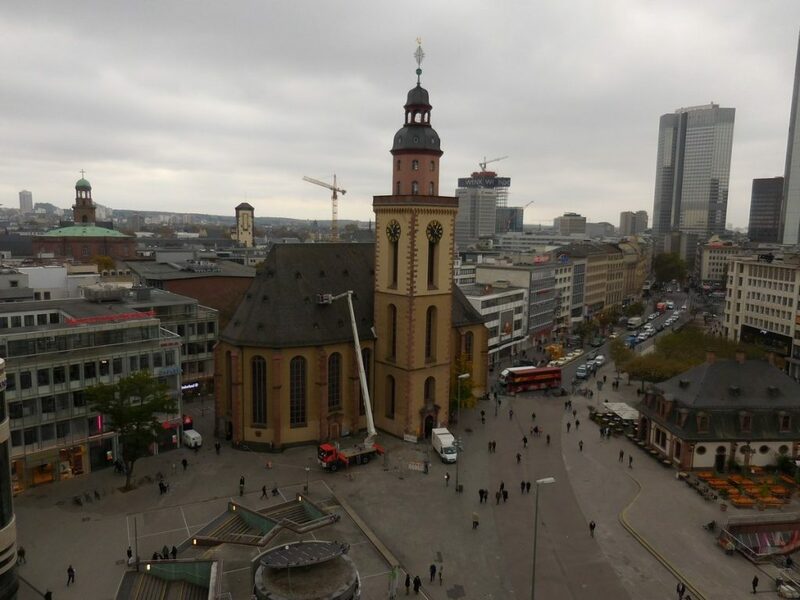 The latter is where you should head to in order to ponder at Frankfurt from above. The Main Tower is home to an observatory platform, measuring 205 m and 55 floors. It gives a splendid view of the city. View of the Main River from the top of the Main Tower. 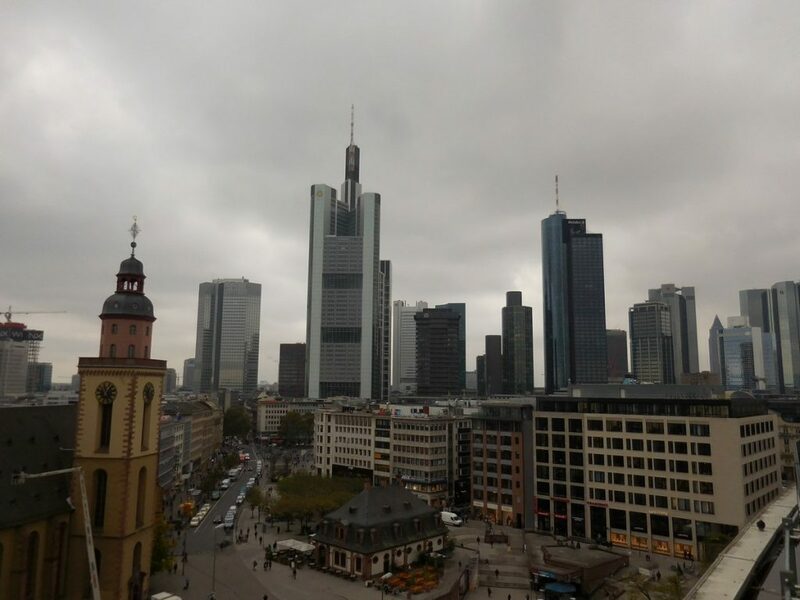 Skyline of Frankfurt. The two black buildings on the right are the HQ of Deutsche Bank. 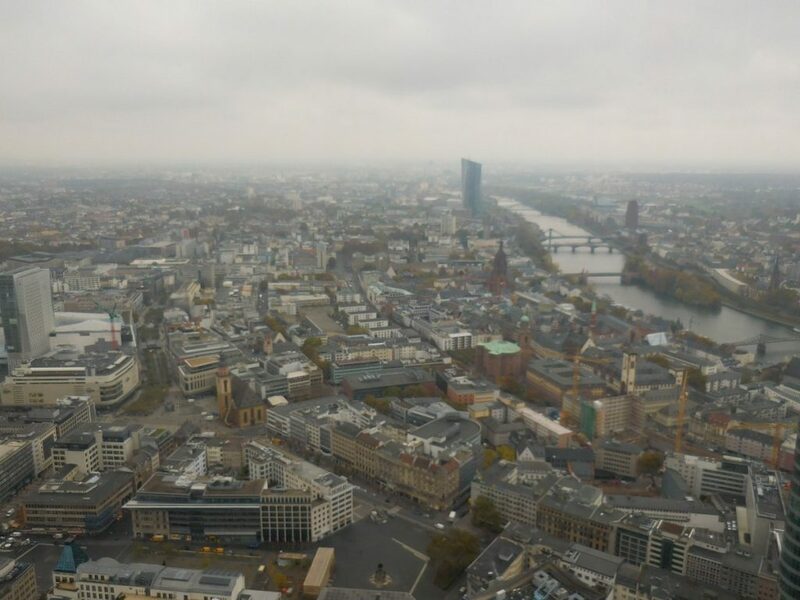 View of Frankfurt from the top. 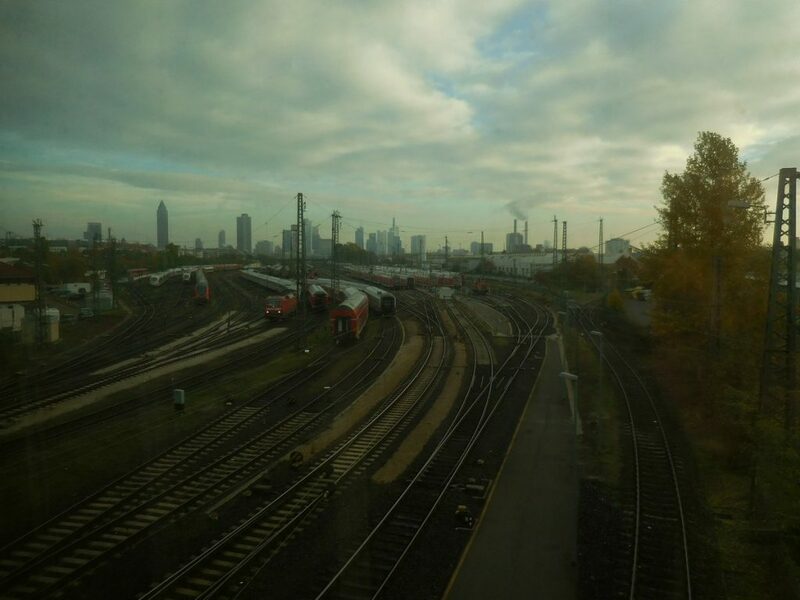 At the background, you can see the Central Station (Hauptbahnhof). When you’ve had enough of your daily Skyline Vitamin, you can visit the Roman Square (Römerplatz) in an effort to quench your “old buildings” thirst. At a stone throw’s away from the skyscraper district is located the ancient Roman village with Römerplatz at its very centre. Mesmerising architecture oozes into the eyes of the visitor as he calmly saunters its streets. Frankfurt may not be the prettiest of cities nor the richest in history and architecture, but it surely is a shopping heaven. Exactly between the Roman Square and the business district is located Galeria Kaufhof. Besides having 8 floors of shops with very diverse assortments, at its very top, you will find a panoramic terrace from where you can further enrich your photo gallery with skyline and cathedral images as well as sip a coffee while contemplating the view. Taking that perfect image definitely requires some time (check the photos below), so after shooting the ideal featured image, just step inside to have lunch or dinner at the restaurant area. 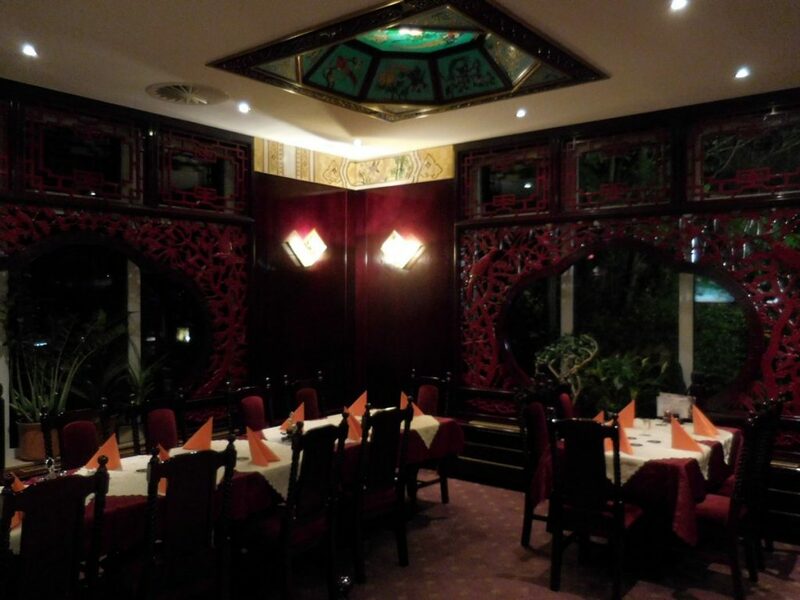 There are daily promotions with menus for a fixed price of 9.95 EUR. View from Galeria Kaufhof to the city. View from the shopping mall towards a church. 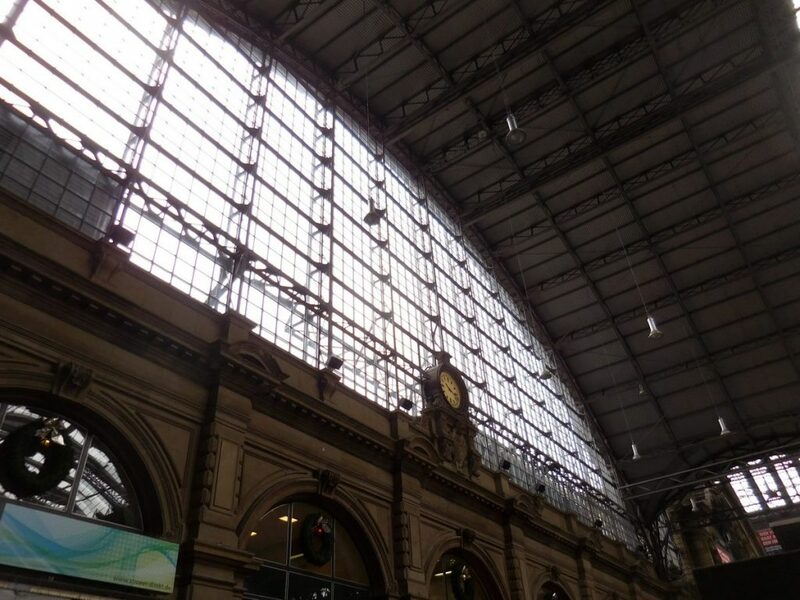 Before leaving the city, make sure to stop by Frankfurt Hauptbahnhof (the Central Railway Station) which is Germany’s largest Central station for passenger trains, housing 24 platforms and, as almost any other station in Deutschland, having a fabulous design. The skyline of Frankfurt while approaching the Central Station. Inside the Hauptbahnhof of Frankfurt. I flew back to Bulgaria from Frankfurt airport. You have to keep in mind that it is the largest airport in Continental Europe and despite it is wonderfully organised and automated in order to facilitate transfers and flying, in general, I strongly suggest you be there at least 2 hours in advance. 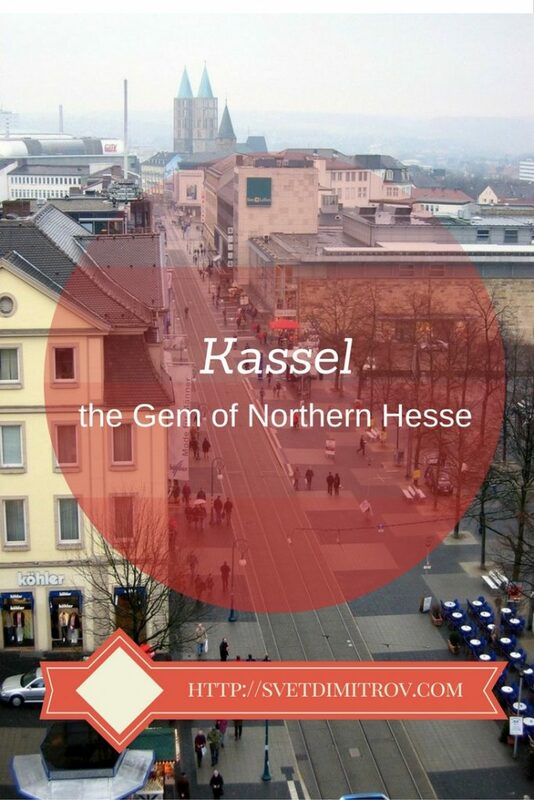 Have you heard of Kassel? Would you visit it if you had the chance to do so? It is surely worth a visit. I have really fallen for the autumn colours and water cascades in summer. The castles are also quite imposing! 🙂 Thanks for your kind comment. Thanks so much, Yag 🙂 It really looks medieval, but it also looks so gorgeous! I have never heard of Kassell before you are right, it must be a lesser known place. The castle and the gallery both look so grand! And all of the food looks delicious. Yes, Kassel really is a lesser known place, but so chic thanks to the grandness of its castles and unique ambience. The food was amazing! Thanks for the introduction to Kassel – looks like there are a lot of beautiful and authentic places to visit … will definitely have to make time for a trip on our next visit to Germany – we’re heading over in summer 2017, and right now just have the major cities mapped out. Will make time to discover the lesser known! 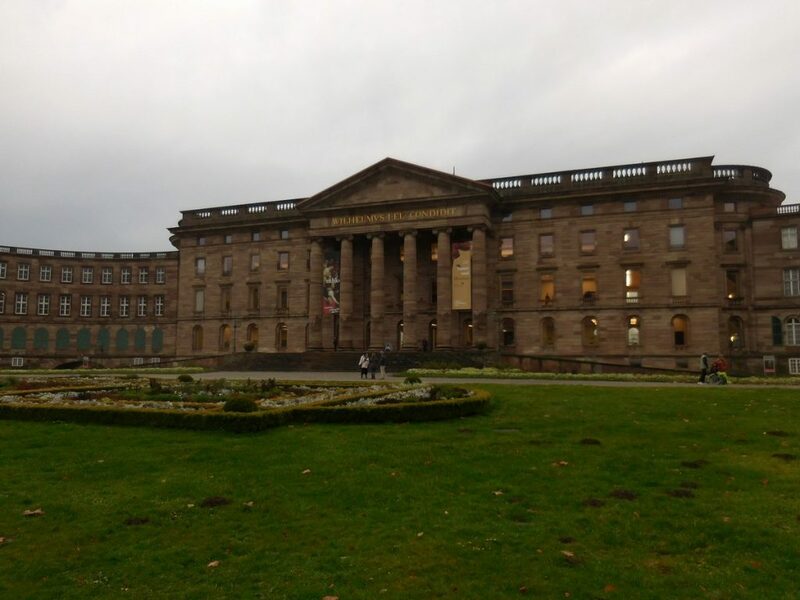 Kassel looks like an off the beaten track destination in Germany that is filled with history. I’m planning a trip to Germany next year and will bookmark this to check out again later. It is super packed with history and tonnes of things to see and eat. Thanks for stopping by!